Over the winter and the first portion of the new year, I was pretty well inundated with commissioned saber builds. Most of those were stunt sabers that to be perfectly honest, got a bit boring after a bit. 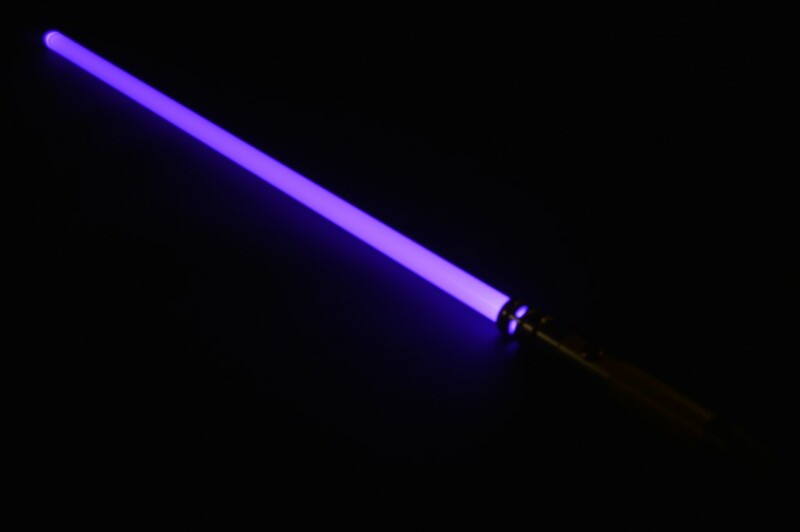 Fortunately, one of my customers asked for a basic saber with sound and even better, a purple blade. I’m calling this one the Republic Defender and let’s take a closer look. Say hello to the Republic Defender! Like many of my other sabers, this one is based on the Ultrasabers Apprentice V4. For a budget hilt, Ultrasabers’ Apprentice is an excellent choice. It has a superbly-placed choke point and the aesthetics comfortably fit any Star Wars era. It is primarily a one-handed saber, but can be used with both hands if needed. The only thing that’s a little disappointing about the Apprentice (and many of Ultrasabers’ entry-level hilts) is that it’s pretty bland. In order to spruce it up a bit, I added a custom powder coat finish (more on this later). I added a Jedi emblem to the saber, opposite the switch. The story behind the pommel is a little interesting. When I first purchased this hilt, it was originally going to be built as a stunt lightsaber replica. However, when this customer came to me with a build request, I decided to re-purpose it for a sound-enabled saber. The problem with that choice was that I only had a solid pommel and such a part would need to be machined and hollowed-out to make room for a speaker I don’t own a mill, so doing that sort of modification was out of the question. Instead, I hit up The Custom Saber Shop and grabbed one of their Style 8 MPS pommels. The Style 8 is a little different than anything offered by Ultrasabers, but beyond improved aesthetics, it also lengthens the hilt enough to make it a really excellent two-hander. I really, really like the MPS Style 8 pommel. The Republic Defender was quite literally the first item I ever powder coated. As soon as my oven and powder arrived (I already had the gun), the hilt was hanging from my makeshift cabinet and ready to be dusted. For the powder coat, I opted to use a silver and gold scheme. 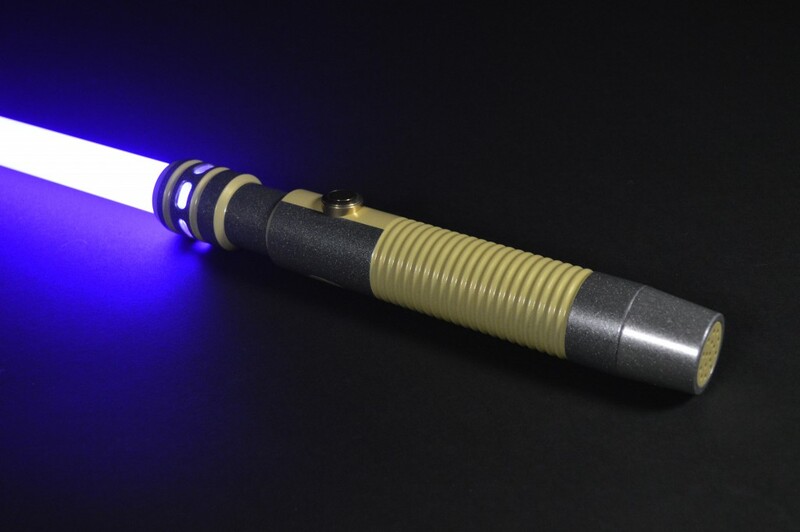 Gold just seems perfect for a purple lightsaber and the contrast between the light gold and the darker silver turned out excellent. Aside from some striping and other accents, I added a Jedi emblem opposite the brass AV switch. All stenciling was done with Oracal 631 vinyl that I pre-cut using my Silhouette Cameo. Oracal 631 is listed as having a maximum temperature of 176-degrees Fahrenheit, but will actually remove cleanly at up to 200-degrees. I first did a full cure application of the silver before applying the stencils. With the stencils on-board, I coated the hilt in the gold and put it in the oven at 200-degrees for 20 to 25 minutes, or just long enough for the gold to transition from powder to liquid (also known as flow-out). I then pulled the hilt out and let it cool to where I could handle it. Next, i carefully peeled the vinyl and placed the saber back in the oven for a final 12-minute, 400-degree cure. This was my first experience with powder coat and my first time stenciling with it as well. The added accents really make the otherwise bland Apprentice V4 pop. Inside the hilt is a Plecter Labs Pico Crumble riding in an MHS V6 chassis with an 18650 Li-ion battery, all from The Custom Saber Shop (TCSS). The Pico Crumble is Plecter’s most affordable board at around $10 less than the Nano Biscotte. It only comes with two swing sounds (fast and slow), a clash sound, a boot sound, and activation/deactivation sounds, all of which are pre-loaded into the Pico Crumble’s firmware. 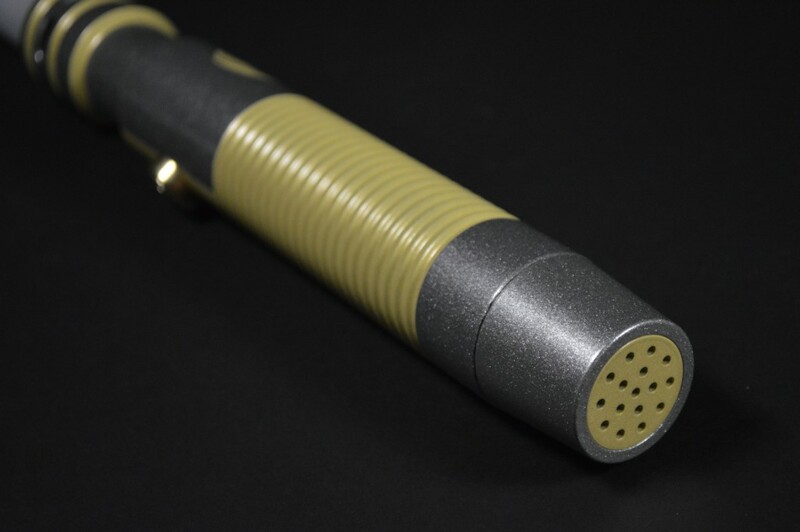 Picos are available with light or dark sounds and since this is a lightside saber, I went with the light version. If you’re used to other boards from Plecter or NEC, the Pico’s sounds can be a little repetitive. That said, it’s far, far better than the soundboard inside the Hasbro sabers with higher quality sounds and superior responsiveness. The lack of track variety notwithstanding, the Pico Crumble is a fantastic board. The Pico Crumble is hidden under some protective electrical tape. Also shown here is the TCSS MHS V6 chassis and the 2W Veco bass speaker. The other thing the Pico Crumble has going for it is its ability to easily support color changing and RGB LEDs. The customer in this case requested a purple blade. To get there, I chose a Tri-Cree XP-E2 RGRb (Red-Green-Royal Blue) from TCSS – royal blue because it produces richer purples. The customer also asked for a true purple and not a pink. This required that I heavily resistor (10 ohm) the red die, but it took a heck of a lot of experimentation to get there. Mixing the royal blue die at full power (1 A) with the weakened red die made for a nice amethyst blade color. 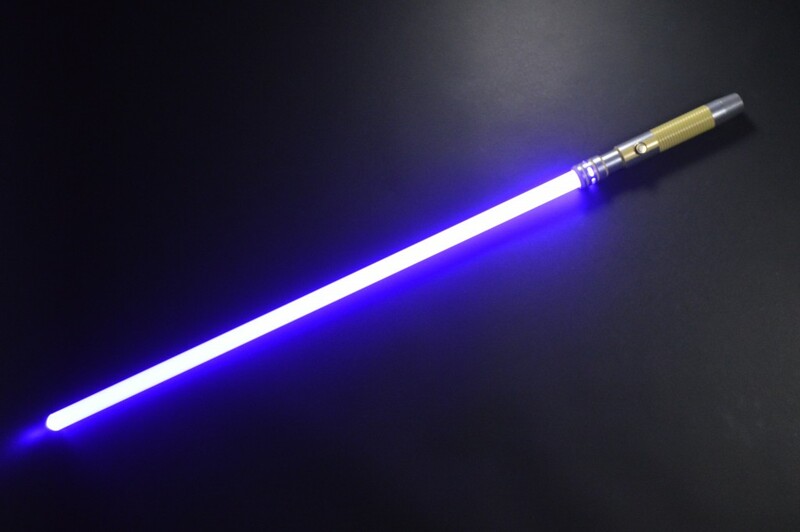 Based on photos I have seen, it’s probably quite close the Dark Violet Amethyst (DVA) color offered by Ultrasabers. 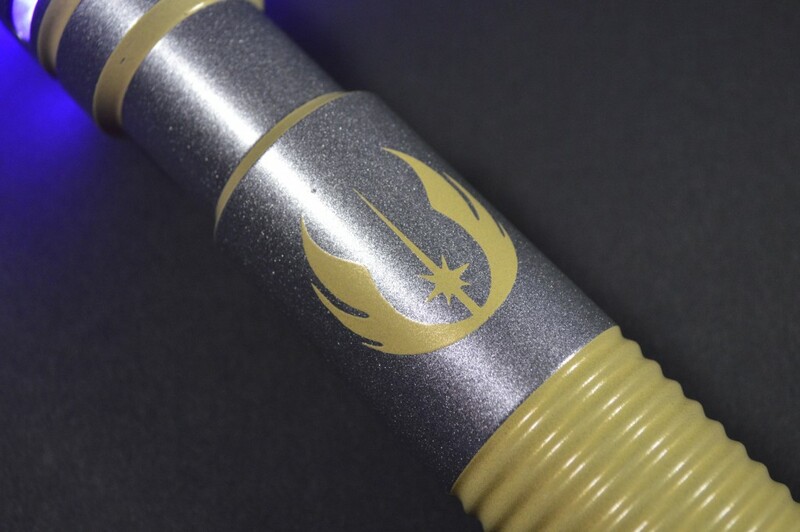 I explain how to use the Pico Crumble’s service menu in the video below, but other colors that can be selected on this saber include red, green, royal blue, ice blue, and lime green. This is about as good as I could do for an accurate blade color photo. Like pretty much every other sound-enabled saber I’ve done so far, the Republic Defender features a Veco 2W bass speaker. These 28mm speakers offer respectable sound quality and are very loud when given enough resonance. Mounted to the MHS V6 chassis and inside the Apprentice V4, the bass speaker sounded superb. Finally, I included an Ultrasabers Heavy Grade Ultraedge blade with this saber. Blades aren’t typically included with my builds – they add to shipping costs and most enthusiasts own several. But since this customer was local, shipping was a non-factor. He also doesn’t own any extras and requested a heavy grade so he could duel with his kids. Though it’s probably overkill given their ages, he certainly won’t have to worry about breaking the blade. That pretty well wraps up this saber reveal. If you have any questions, please be sure to post those in the comments. Thanks for stopping by! WOW I am so glad I found your site. 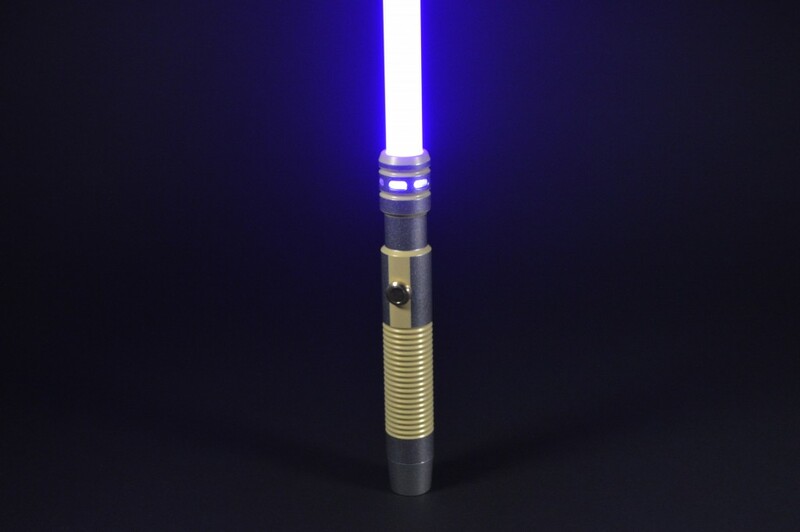 I just received my Grab Bag Dark Apprentice LE v4 from Ultra Sabers that I had configured with a Violet Amethyst LED. I am happy with it except for the battery life and wanting to add sound. So reading your write-up was just what I needed. I do have some questions. What is the size of the AV switch you used in mm? I don’t know what make and model of LED is being used in my saber other than it is an RGB along with a resistor and 4 AAA batteries. My main concern is getting more info on the LED so I can properly determine the right resistor for the battery change and proper sound card voltage. Is the Pico sound card the only one that will fit in a Dark Apprentice LE V4 hilt? Would your parts inventory also fit in a Dark Initiate V4? Thanks in advance. The Pico Crumble is not the only card that will fit in this hilt. In fact, any of the Plecter Labs or NEC boards will. While the Pico is the smallest of the bunch and easiest to work on, it isn’t the only option. The Nano Biscotte is only slightly larger and works well too. Chances are, your saber is running either a Luxeon Rebel or Cree XP-E2 star. In either case, my recommendation (assuming a 3.7v battery) would be to resistor the red die at around 8-10 ohms. The blue will probably need around 0.20 ohms of resistance, which can be accomplished by wiring two of TCSS’s .47 ohm resistors in parallel. I would leave the green without a resistor. The switch I used was a 16mm brass anti-vandal type with a matching bezel. 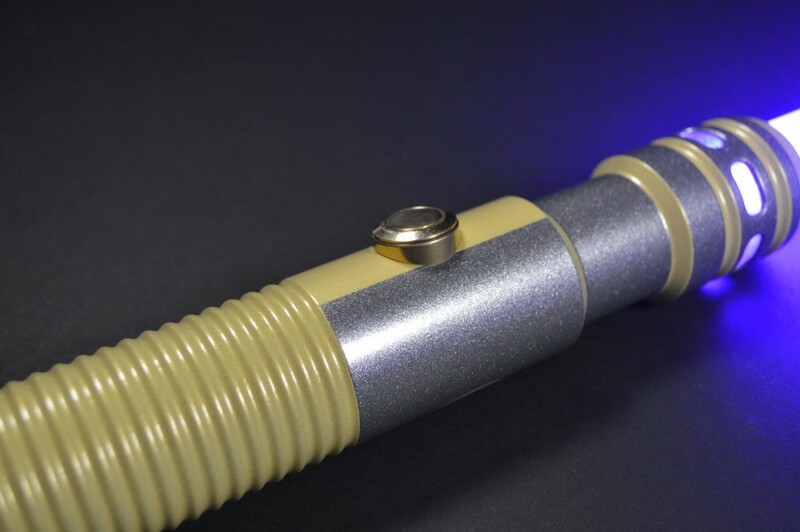 If your saber has a guarded switch, you can swap that out for a momentary version. Also, the recessed holes used by Ultrasabers for the guarded switches will fit 12mm AV switches as well. Since the Initiate V4 is exactly the same internally, all of this would also work in it. Thank you for the quick reply :). Something just occurred to me that brought up two more questions. How was the battery light on your purple blade? With 4 AAA I get about a solid hour for full purple color before it starts to fade to pink fusha/magenta then red. How are you managing to power your light saber with just one 18650 at 3.7 volts when 4 AAA at a total of 6 volts starts to fade after an hour? Before I fully answer your question, I think it would help to clear up some basics with respect to voltage, amperage (current), etc. For this application, think of your saber’s electrical circuit as a water line. Voltage is like the pressure and amperage is like the total amount of water flowing through the pipe. The wire is, well, the pipe itself. Amp-hours (Ah, most often expressed as milliamp-hours or mAh) is a capacity measurement that states how long a battery can discharge at 1 A of current. Wired in series (as they are in the Utrasabers packs), your alkaline AAA batteries offer a total voltage of 6 V at full charge. However, the series wiring does not increase their capacity and as such, even the best AAA alkalines struggle to offer more than 1,200 mAh. On the flip side, the 18650s I currently stock are rated for 3.7 V and 2,600 mAh. That’s over twice the capacity. Li-ion are also capable of being discharged at much higher rates than alkaline cells (more on this in a moment). Finally, Li-ion cells provide more consistent voltage and current. After you run your alkaline-powered saber for 10 or 15 minutes, your batteries are probably only pushing around 1.2 V each. By the time they’re ready to die, they may only be at around 1 V per cell. This is why you see the color shifting. As the battery runs low, it simply cannot sufficiently power both the red and the blue dice. Since the blue requires more voltage, it tends to dim first. Li-ion and NiMH are more consistent in this regard. 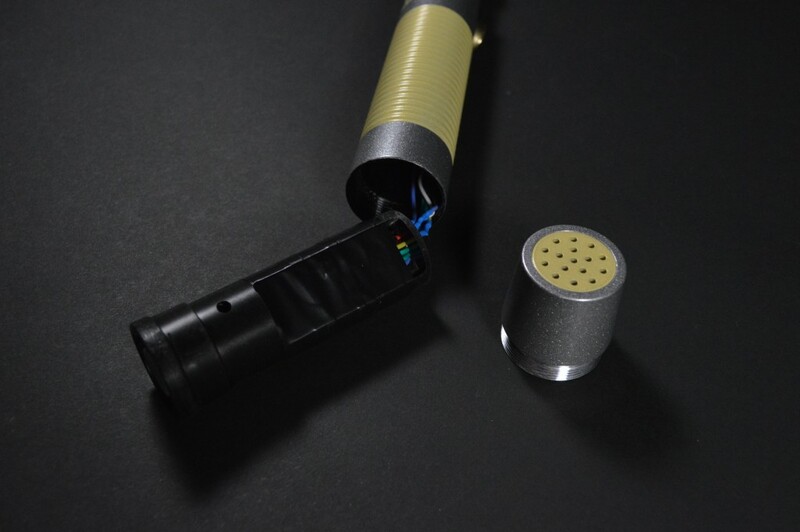 Ones like the cell in this saber come off the charger at around 4.0 V and sink to 3.6 V over the life of the charge before abruptly running dead. Therefore, this saber will also turn a bit pinkish, but it is only losing .4 V over a charge cycle versus an additive 2 V for your alkalines. The standard operating current for most saber LEDs is roughly 1 A per die. The warm-color Rebel dies are usually rated for 700 mA, but let’s roll with 1 A for this discussion. Each LED color requires different voltage (or pressure) to actually consume 1 A. For example, to run a green Cree XP-E2 die at 1 A requires around 3.7 V, but a red Cree XP-E2 requires only 2.6 V to get that much juice. LEDs aren”t intelligent, though. Therefore, they’ll try to pull as much from the battery as possible. The battery isn’t necessarily pushing current to the LED, rather the lamp is pulling from the battery. So long as you’re within the battery’s discharge capabilities (around 800 mAh to 1 A for most alkaline cells and 3+ A for 18650 Li-ion), the battery will provide as much as the LED wants. If I were to hook my red XP-E2 up to my 3.7 V 18650 without any resistors, it would try to pull all 3.7 V and would therefore receive far more current than needed (well above 1 A). This is why studying voltage curves is important. As you increase the voltage available to an LED, the current that the LED consumes also increases. Once you get a Cree XP-E2 up over 1.5 A of current, you seriously risk blowing the die. That’s largely why 1 A is considered the safe limit. Adding resistors limits the amount of current that can be served to the LED. You can add them to either side of the light (positive or negative) as they simply function to slow the flow of electricity through the circuit. You also need to calculate the wattage for your resistor(s). Higher wattage resistors dissipate heat better, but are also larger. Use (V(B) – V(L)) * A to calculate the needed wattage. If you’re using 1 A of current, both values (wattage and resistance in ohms) will be the same. Now, you may run into situations where the needed resistance isn’t available. For example, a royal blue XP-E2 needs 3.47 V to run at 1 A. Since I had a 3.7 V battery, that meant I needed a .23 ohm .23 W resistor. TCSS does not offer such a beast. However, they do offer a .47 ohm .5 W resistor. Wiring resistors in parallel halves their effective resistance, but adds their wattage. Therefore, I ran two of the .47 ohm resistors in parallel to get around .235 ohms of resistance with 1 W of available dissipation. For reference, wiring resistors in series adds both their resistance and their wattage. So what does all of this mean? First, your DVA LED doesn’t need anywhere near 6 V to operate. 3.7 V is sufficient for just about every LED used in sabers. Even in Tri-Cree or Tri-Rebel setups, 3.7 V is fine. Most wire their LEDs in parallel, so the more important factor is battery discharge capabilities and capacity (2 dice running at 1 A each needs 2 A of total juice, 3 need 3 A, so on and so forth). That’s why if you look inside your saber, you’ll probably see one or two relatively large resistors to help limit the current (and thus voltage) to the LED. I hope this helps . Let me know if you have any other questions. I also noticed that the LED heat sink module from TCSS is a bit shorter than the LED Module that came with the original LED. I am wondering if I am going to have to install a retention screw to keep it from sliding down the inside of the hilt. Did you have this problem? It might be a good unit to practice with, but you won’t get the brightness of a Cree or Luxeon Rebel star. As for the heat sink unit, I’ll probably have to see a photo. 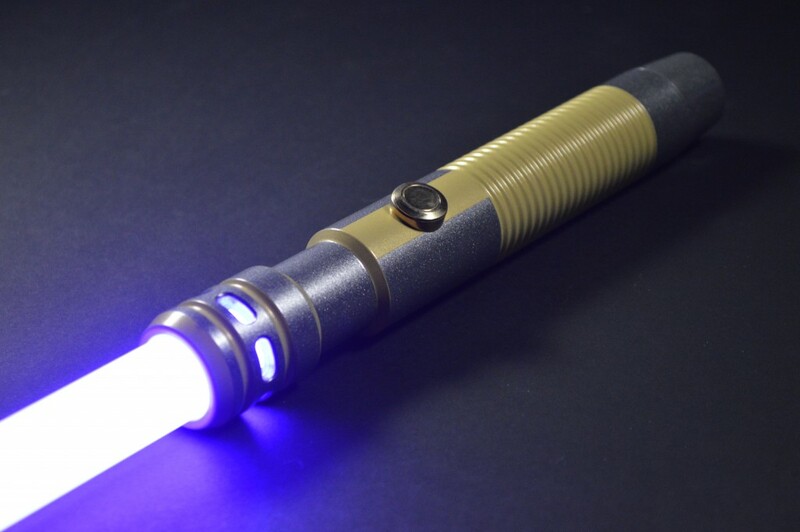 To be honest, Ultrasabers should put LED retention screws in all of their builds. I’m going to start doing them in Ultrasabers-based hilts I do from now on because having the LED smashed against the switch is bound to cause problems down the line. If you are capable of drilling and tapping an 8-32 hole opposite the switch and up near the choke point, it would be a good idea. Thank you so much for your help . As usual you have given me so much information.